Congratulations to Sandra C., the winner of Virginia's giveaway. Thank you to all who participated! One of the first books I read about writing was Debra Dixon’s GMC: Goal, Motivation & Conflict. In the chapter called Conflict Mascots, in which she discusses techniques to heighten conflict, there is a section on Setting in which she tells writers to “Toss your character in a strange environment.” She places this under a heading she calls “Fish Out of Water.” Ms. Dixon refers to the Indiana Jones character and his adventures in unknown—exotic—places. The “fish out of water” analogy has always resonated with me because we can understand the conflicting emotions of being tossed into a strange place. But the “fish out of water” method doesn’t have to apply to a character in a new place. It can also apply to a character in a place that was once familiar (home) which has suddenly changed because of circumstances or because another character has made an appearance and turned the familiar, comfortable setting into an alien and dangerous place. Both of these types of settings drive the characters’ emotions and choices and present life-threatening complications in romantic suspense novels. We as readers may prefer one of these over the other. TOTHE LIMIT, my RWA Golden Heart Finalist, is the story of Mary Beth Williams who is determined to save her brother from the South American terrorists that kidnapped him. To accomplish this in a dangerous and foreign country she knows nothing about, she enlists the aid of Nichols Romero, a world-renowned diplomat of said country. As they face the dangers of traveling away from what Mary Beth considers civilization, she’s not sure why the mysterious Nick chose to help her. But she must depend on him in this unfamiliar and dangerous setting. The fictitious and exotic San Mateo, based on Peru, ratchets up the suspense and conflict, and sets the mood. It provides the tapestry that holds the characters together in a struggle to survive and love. In my newest release, AGAINST THE WIND, FBI Special Agent Michael Alvarez is running from false charges of fraud and the determined pursuit of someone bent on murdering him. He runs straight into an oncoming hurricane and Blair Davenport. Blair rejected Michael’s proposal six years earlier after a week of passion. She’s totally unprepared to see Michael after all this time and doesn’t know how to deal with him, nor with the fact that someone is trying to kill him. The setting, the place Blair knows so well and which was safe, is thrown into chaos not only by Michael’s arrival, but by the incoming hurricane. She must face an unknown and dangerous situation. The suddenly alien situation ratchets up the suspense and conflict and pushes the characters together as they struggle to survive and achieve their second chance at love. “We need to go,” she said. Even if he’d taken leave of his senses, she couldn’t abandon him to ride out a category three hurricane. She couldn’t leave anyone to that fate. “You can’t stay here.” She sounded more like she was speaking to her eighteen kindergarten students than to a grown man. “I can’t leave.” Now he did look at her, those dark eyes intense, but still cool. That gave her pause. Torn between the need to protect herself and some other undefined feeling, she managed, “I will.” There. She’d said it. That the words were those he’d expected six years earlier wasn’t wasted on Michael. She read the surprise on his face. Michael moved toward her, away from the window. Blair took in the sensuous mouth, the beard-roughened jaw, and the amazing eyes. The way his body moved. This was the man she’d said no to. “Go get in your car, Blair,” he said, standing before her. Blair felt his nearness, the heat from his body. For a single moment she thought he might touch her cheek, but he never raised his arm. Michael watched her leave, Nell’s hurricane-force winds pulling at her bright yellow slicker. She put some more of Alice’s things in the trunk of her silver Toyota and, with one last glance toward the kitchen window where he stood, walked around to the driver’s side of her car. That’s when Michael saw him. Hiding behind a supporting piling, ready to make his move. A month ago, he wouldn’t have hesitated to burst out of the door, pistol drawn. Today, with Blair in the way and exhaustion lingering despite his nap, he waited a fraction of a second too long. A single shot would have taken the man out and rendered Blair safe. But it was too late. He saw Blair turn, saw her body stiffen as she took in the sight of the stranger holding a .357 on her. The man mouthed directions at her, the revolver aimed straight at her chest. 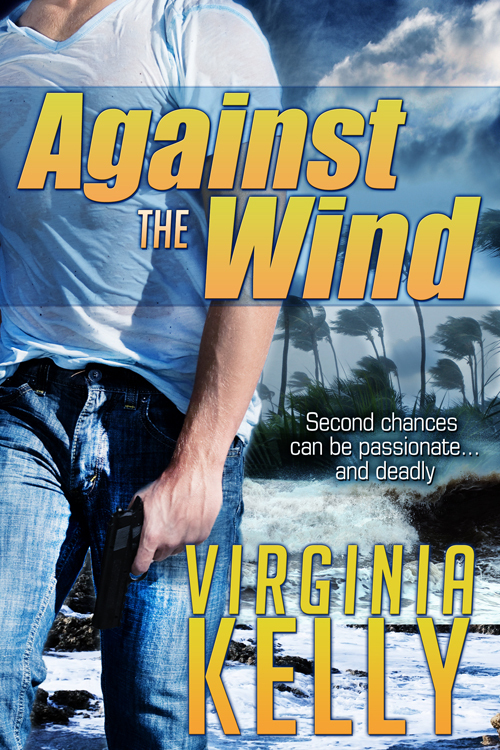 Against the Wind is FREE today at Amazon. Hop over and pick up a copy of the ebook at amzn.com/B007XUL91O! Tell a friend! Kindle books can be read on your computer, iPhone, iPad, Android phone, or Android tablet using the free Kindle app. Calibre, a free software application found at http://calibre-ebook.com/, can be used to convert Kindle books to other formats for other ereaders such as Nook. If you were to find yourself in either of the “fish out of water” story types above, who would you choose as your leading man? (If you’re a writer, please feel free list your book title.) Just to get you started, here are my choices: Jensen Ackles, Pierce Brosnan, Hugh Jackman ... my list goes on. Who’s on your list? Author Bio: Virginia Kelly’s first book was an RWA Golden Heart Finalist and, once published, went on to final in several writing contests. She lives in Florida with her husband and children. She enjoys family, the outdoors and travel. Visit her website at http://virginiakelly.net or her Pinterest boards for more on the (real) settings of her books. Giveaway ends 11:59pm EST June 29th. Please supply your email in the post. You may use spaces or full text for security. (ex. jsmith at gmail dot com) If you do not wish to supply your email, or have trouble posting, please email maureen@justromanticsuspense.com with a subject title of JRS GIVEAWAY to be entered in the current giveaway. Print book prizes are eligible in the US and CANADA. I too enjoy fish-out-of-water stories and unusual settings. Your books are just what I enjoy. Must reads. My book, Primal Obsession, has both, a nature-phobic heroine stuck in the wilderness but with a hunky hero. Thanks for posting, Susan. Primal Obsession is a great example of a fish-out-of-water story. Great post, Virginia! Your story immediately made me think of Romancing the Stone where Joan Wilder goes to South America to rescue her kidnapped sister. She wrote about wild and exciting romance, but didn't live a wild and exciting life, so it definitely was a fish out of water. I agree, Romancing the Stone was a fantastic fish-out-of-water movie. To me, it's a classic. Your A Howl for a Highlander sounds very much like one, too. One of my favorite fish-out-of-water movies is Witness. It has both the police detective out of his element in the Amish community, and the Amish world invaded and changed by violence. Thanks for buying, Ann. And you're so right. Witness is the perfect fish-out-of-water story. How could I have forgotten? A gorgeous movie. Thanks again, and thanks for dropping by. Thanks for dropping by, Tammy. I'm a greatgrandmother so I'd have to pick Clint Eastwood (loved THE BRIDGES OF MADISON COUNTY) or Tom Selleck (Jesse Stone). These are all great examples, and I am eager to read Against the Wind and To the Limit. In my suspense novel Border Heat, Secret Service Agent Tucker Daye is accustomed to working under many conditions, but throw him into the Texas desert in his regulation SS suit and tie, on the run with his ex-flame Shannon Walker and the President's teenage daughter and he is definitely a fish out of water. Your novel sounds like a great fish out of water story. On the run, IMO, always is. Hi Virginia, Against The Wind is a great example and sounds like a great read. Wishing you many sales. Both books sound like ones I would enjoy... I really have to get a Kindle or a new computer... I miss out on all of the freebies everyone shares... enjoy fish out of water stories... hmmm... I am thinking my choice would be Chris Hemsworth... thanks for sharing! Maybe you could go ahead and download the freebies and save them on your Amazon account or PC until you get a reader. Thank you, Sheila, for the kind words. Fish out of water tropes are a great way of advancing conflict. In my Temptation in Tartan, set in 1747 Scotland, a young English noblewoman agrees to a marriage of convenience to a darkly handsome laird. After reaching his castle in the remote northwest Highlands, she eventually realizes that the clan may be comprised of strange creatures she's never heard of: vampires. Vampires! That sounds very fish-out-of-water for your heroine. I love vampire stories and am a big fan of Buffy, Angel and True Blood (the Charlaine Harris books, too). Nice post. The books sound good. I'd choose Bradley Cooper. Bradley Cooper's a very nice choice for a hero. I would pick Gerard Butler. He played the villain very well in Law Abiding Citizen and a hero in 300. He is talented. He's also funny in He Said, She Said. Emily in Woman at the Light by Joanna Brady is definitely out of her element. The story take place in 1839. She was raised in a high society and then ended up in a Key West, Florida. Gone is civilization. Worst thing is she wanted to make known that her lover is black which society in Key West would isolate her. Even her two children know that society wouldn't accept her with a black man. Oh, yes. Gerard Butler. He is funny and talented. Emily is definitely out of her element. Hers sounds like a most difficult story. Thank you for stopping by, Kai. I agree on your choices. Hugh Jackman is always on my list, and Chris Hemsworth is a newer discovery. It looks like Jeremy Renner is going to be fabulous as the new Bourne, though I'll miss Matt Damon in that role. Glad you stopped by and hope you enjoy Against the Wind.